Can you correctly identify these critters? 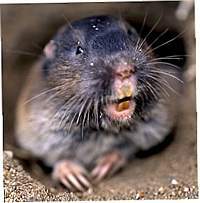 Voles are often confused with moles and gophers. 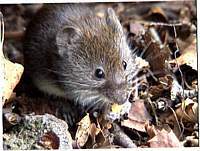 A vole is a medium to large mouse, but it has smaller ears. It is also called meadow mouse or field mouse and is found in areas of abundant food and shelter. These animals can do a great deal of damage to orchards, row crops and landscaping in a short period of time. The female vole has an average of 3 to 4 litters of 3 to 6 young a year. Vole burrow openings will have all of the grass at the edge closely cropped and there will not be any apparent soil mounding. Another sign of vole activity will be the presence of surface runway tunnels made through heavy vegetation or grasses. Like gophers and moles, voles do not hibernate and are active throughout the day. Moles have a larger range in comparison to other burrowing animals because it must cover a greater territory to meet its food requirements. They eat up to 1.5 times their body weight a day. This large food requirement results in fewer moles per acre than gophers or voles. Male moles may cover up to 20 times the area of male gophers. The result is the creation of many feeding tunnels covering large areas. The tunnels are usually very shallow and create a ridge pattern on the surface. The mounds created by moles from the creation of these tunnels are typically shaped like volcanoes and can reach heights of up to two feet tall. Moles are insectivores and most damage to plant life is incidental rather than intentional. Moles have tiny eyes which they keep closed to keep dirt out. It’s sometimes thought that they don’t even have eyes. Newborn moles are blind, but mostly because their eyes are sealed shut until they are 11 days old. 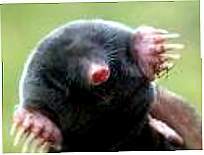 There are 18 species of moles and some are completely blind. Like gophers and voles, moles do not hibernate, and are active throughout the day. Gophers are often confused with voles or moles. All of these creatures leave their own distinctive marks that can be used to differentiate between them. Gopher mounds will be found in a fan shape radiating outward from a focal point. Gophers are voracious herbivores and make plants disappear. Their teeth can do damage to roots of plants, as well as plastic pipes and electrical wire. Moles cause plant damage when foraging for insects and grubs near the plants roots but do not eat the plants. Voles will stop to "snack" on vegetation found in the creation of their burrow, but foraging for food underground is not their typical practice. Gophers live from sea level up to 12,000 ft. in a wide range of soil conditions varying from rocky to sands and loams, but will avoid wet, saturated or heavy clay conditions. They prefer sandy soils.